Perfect binding is a common bookbinding technique used for commercially produced books as it is a fast method of binding books that can be easily scaled up to meet the production volume required by commercial book publishers. In Perfect Binding, sewing of book signatures are not required. Instead, strong, hot melt adhesive are used to bind book pages together. By removing the process of sewing, commercial bookbinders have been able to speed up bookbinding and production times. However, if you were to compare the strength of a sewn book and a book held together with adhesive, perfect bound books are generally less durable. Being the easiest bookbinding technique, Perfect binding is a great way for new and aspiring bookbinders to experience the thrill of creating your very first book. Here’s how you can do your own Perfect Bound book project at home. This tutorial shows you how you can make a perfect bound, hard cover notebook. 2 hours for the entire project + another 1 hour for the completed book to dry and set. 20 pieces of A4 Paper (these will become the pages in your book) – the actual number of pages used can be varied. 1. Fold your A4 paper into 2 equal half with your bone scorer and cut along the folded line. (Optional) You might want to clean up the spine if your cuts were not straight. 3. Assemble your text block: Line up the paper, ensuring a straight spine. 1. Clip your paper block and hold it in place. Alternatively, if you are using books to hold your text block. Make sure the spine area juts out, facing you. This will allow you to glue down the area easily. 2. Spread an even layer of glue along the book spine. 3. Wait for glue to dry. 4. You might want to spread at least 2 layers of glue over the spine. Just repeat steps 2 -3 again and let your book spine dry. 1. Measure the dimensions of your text block: Height, Length, Thickness. 2. 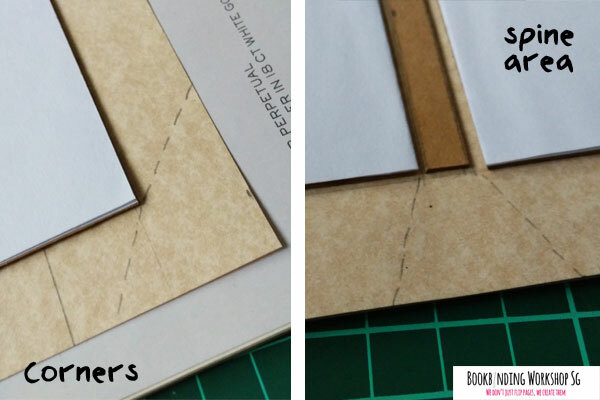 Using the dimensions you have, prepare the backing for the book cover by cutting out 3 segments using the card stock. You should have 2 large rectangular segments that will be the backing for the front and back covers of your notebook. As well as a narrow rectangular segment that fits the spine of your book. 3. Layout the book cover segments on the A3 art paper. Leave a 0.3cm space between each segment. 4. Glue the book cover segments to the art paper. You should have 2 extra A4 paper at this point. 5. Fold 2 new A4 paper into half. Place 1 on the top and 1 on bottom book cover segments. You do NOT need to cut these into halves.They will help hold your book cover to your text block. 6. Glue the end papers to the book cover segment. Leave these to dry under some heavy weight (like a thick dictionary or something similar) to prevent the covers from warping. 8 . Cut along the dotted lines. 9. Fold in the excess art paper. Use the bone scorer if you want to ensure tight folds. 10. Glue the excess art paper onto 1 side of your endpaper. 11. Glue your text block to the inner side of the book cover card stocks. This perfect binding tutorial is (in my opinion) the most easy way to start experimenting with bookbinding. Of course, the fun part of bookbinding tends to be the sewing. But with this tutorial, you get to hold your very own book in your hands within just hours. Plus, this has to be the safest, kid-friendly bookbinding method ever. If you are thinking of ideas to keep a child entertained, this might be it. All you need is glue, some pre-cut paper and you are good to go.